VANCOUVER CANADA — This city has its own Prince of Pot, cannabis promoter Marc Emery. But he’s minor royalty next to Don Briere. Or Donald Joseph Briere, as he’s known inside the Canadian justice and penal systems. He was once this country’s most prolific marijuana producer and distributor, with 33 illegal growing operations hidden across B.C. He made B.C. bud famous. And he paid a price. Mr. Briere was convicted in 2001 on charges that included drug cultivation, possession for the purpose of trafficking and possession of a prohibited firearm. He was sentenced to four years in prison. While on parole in 2004, he was busted again, this time for running an illegal marijuana shop on Vancouver’s hipster high street, Commercial Drive. For that blatant infraction, he was convicted and sentenced to another 2.5 years behind bars. Mr. Briere is now 63, and with all the legal hassles and two heart attacks behind him, one might think he’d have retirement in mind. Far from it. 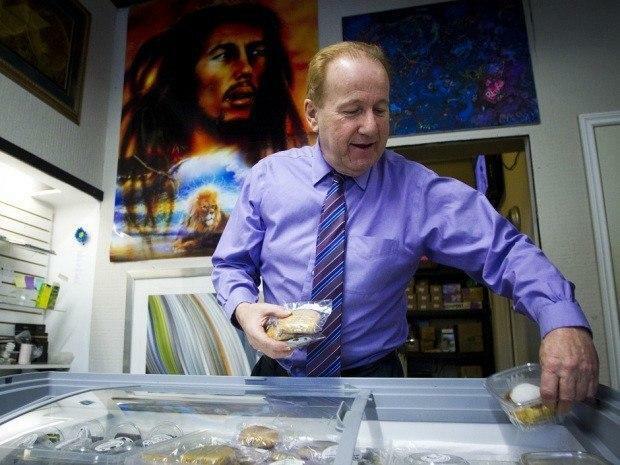 The irrepressible pot impresario is back in the marijuana trade, making his mark in retail. He’s selling potent cannabis products from a chain of eight stores he has opened — and has managed to keep open, despite admitting his product is recreational, not medicinal — over the past 20 months in Vancouver. Weeds Glass and Gifts does a brisk business. He’s got six more shops on the way, including new outlets in Surrey, North Vancouver, Whistler and Sechelt, a vacation paradise just up the coast. Mr. Briere says he’s also looking at potential stores in Toronto and Montreal. These aren’t dimly lit backrooms where shifty-eyed dealers slip greasy dime bags into the pockets of nervous adolescents. Business is conducted openly, inside shops on busy streets. They have regular store hours. Mr. Briere compares his Weeds outlets to Tim Hortons Inc., the ubiquitous doughnut and coffee provider. The products are fresh and plentiful. The quality is consistent, and so, he hopes, is the customer experience.